Height: To shoulder, 24-28 in. Length: Body 1-1.6m (3 1/4- 5 1/4ft). Tail: 60-85cm (23 1/2- 33 1/2in). Sexual maturity: Males, at least 3 years. Females, 2 years. Mating season: Year-round. Females usually breed once every 2 years. Litter size: 2-6, usually 3-4. Habit: Solitary, generally hunt at dawn and dusk, but active by day in areas undisturbed by man. Diet: Mainly deer, most wild animals. Several subspecies, two endangered: Felis concolor coryi (Florida) and F.c. cougar (northeastern North America). Throughout North and South America from southern Canada to Patagonia. The status of the Florida panther remains uncertain. It is still regularly listed as subspecies P. c. coryi in research works, including those directly concerned with its conservation.Culver et al. noted low microsatellite variation in the Florida panther, possibly due to inbreeding responding to the research, one conservation team suggests, "the degree to which the scientific community has accepted the results of Culver et al. and the proposed change in taxonomy is not resolved at this time. The mountain lion is a protected species, but most farmers and cattle ranchers object to its presence. Many animals are shot to safeguard herds, in spite of evidence that mountain lions rarely attack domestic stock. Mountain lions are carnivores (meat eaters) and generally hunt at dawn and dusk. Still, they are active by day in areas undisturbed by man. Like other cats, the mountain lion stalks its prey, sprinting after it if it attempts to flee. Then, pouncing on the animal's back with a powerful leap that knocks it to the ground, the mountain lion kills its prey with a single bite to the nape of the neck. Mountain lions have large hunting territories, and they eat most kinds of animals. Throughout their range, however, deer is their principal food. In the absence of deer, they eat anything available, including cattle and other domestic livestock. Mountain lions can run very fast over short distances, but they tire quickly. If an animal survives a mountain lion's first attack, it generally escapes. Mountain lions rarely share hunting territories and usually avoid each other, but they make no attempt to defend their own territories or take over those of others. 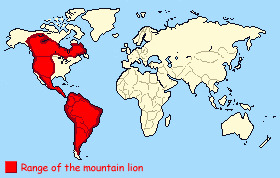 Mountain lions are found in habitats as diverse as the cold, northern woods of Canada, the rocky, western country of the United States, and the tropical rainforests of Brazil. In Argentina, they live in the pampas, and their range extends to the southernmost tip of South America. Instead of occupying a permanent den, mountain lions rest and find shelter in caves, among rocky outcrops, and in dense vegetation. They generally migrate from the mountains in winter to follow deer and other prey. The territories of male mountain lions may overlap those of females, enabling the males to detect when the females are ready to mate. During a 14-day period of mating, a male and female will break their normally solitary habits to hunt together and sleep next to each other. The female later gives birth to two to six kittens in a carefully hidden den, located between rocks or in a cave. Blind at birth, the kittens have spotted coats until they are six months old. They begin to take meat provided by their mother at six weeks, while they are still suckling. Although they can hunt for themselves after nine months, they usually remain with their mother for two years. The cubs then leave her and may stay together for several months before wandering off to establish territories of their own. Once common across the western hemisphere, the mountain lion has been eradicated in many areas, and its survival is threatened. In some areas, mountain lions were wiped out in an attempt to protect deer populations. But eliminating a natural predator disrupted the balance of the environment. Consequently, the deer multiplied rapidly, and their habitat was unable to support the large population. 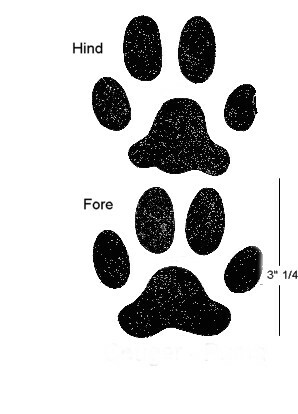 • Mountain lion tracks appear round, are approximately 3 to 4 inches in diameter, and the claw marks usually are not visible. • Droppings are 4 to 6 inches in length and 1 to 1 ½ inches in diameter, cylindrical, and blunt on the ends. Droppings often have hair and bone fragments visible. They are often covered with dirt. • Cached prey items are a sign that a lion has been in the area and may return again to feed on the cached food. • Lions often leave vertical claw marks on trees, stumps, or fence posts, 4 to 8 feet above the ground. • Lions make a variety of calls or vocalizations. They include: hiss, purr, mew, growl, yowl, chirp and cry. More people moving into lion habitat. Increase in deer populations and density. Presumed increase in lion numbers and expanded range. More people using hiking and running trails in lion habitat. There's been very little research on how to avoid mountain lion attacks. But mountain lion attacks that have occurred are being analyzed in the hope that some crucial questions can be answered: Did the victim do something to iandvertently provoke an attack? What should a person who is approached by a mountain lion do -- or not do? If you’re hiking with pets, keep them on a leash and close to your group. Roaming pets are open to cougar attacks, or they could irritate a cougar that’s trying to avoid your group. A dog on a leash is also a good warning system that will let you know if a cougar is nearby. Do not hike alone. Go in groups, with adults supervising children. Keep children close to you. Observations of captured wild mountain lions reveal that the animals seems especially drawn to children.Keep children within your sight at all times. A Person squatting or bending over looks a lot like a four-legged prey animal. If you're in mountain lion country, avoid squatting, crouching or bending over, even when picking up children. Fight back if attacked. A hiker in Southern California used a rock to fend off a mountain lion that was attacking his son. Others have fought back successfully with sticks, caps, jackets, garden tools, and their bare hands. Since a mountain lion usually tries to bite the head or neck, try to remain standing and face the attacking animal. Deer-proof your landscape: Avoid using plants that deer prefer to eat; if your landscaping attracts deer, mountain lions may be close by. Install outdoor lighting: Keep the perimeter of your house well lit at night - especially along walkways - to keep any approaching mountain lions visible. Do not hike alone: Go in groups, with adults supervising children. If you encounter a mountain lion: --Keep children close to you: Observations of captured wild mountain lions reveal that the animals seem especially drawn to children. Keep children within your sight at all times. Do not run from a lion: Running may stimulate a mountain lion's instinct to chase. Instead stand and face the animal. Make eye contact. If you have small children with you, pick them up if possible so they don't panic and run. Although it may be awkward, pick them up without bending over or turning away from the mountain lion. Do not crouch or bend over: If you're in mountain lion country, avoid squatting, crouching or bending over, even when picking up children. Do all you can to appear larger: Raise your arms. Open your jacket if you are wearing one. Throw stones, branches or whatever you can reach without crouching or turning your back. Wave your arms slowly and speak firmly in a loud voice. The idea is to convince the mountain lion that you are not prey and that you may be a danger to it. If you have children, pick them up. Try to pick children up before they panic and run. When you’re picking your children up, keep an eye on the cougar but avoid making direct eye contact with the animal. Try not to bend over too far or turn your back to the cougar. The mountain lion is found over a wider range than any other mammal in the western hemisphere,except for man. Mountain lions vary greatly in size. A mountain lion pounces so violently that it can drag its prey 20 feet along the ground. 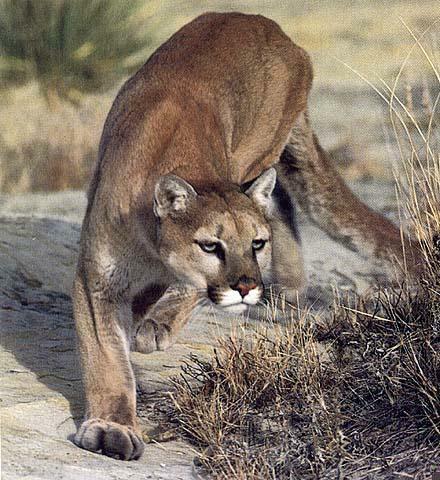 Mountain Lions have many names, They are also called Cougar,Puma,Catamount,American Lion,Mountain Cat. They Have more names then any other big cats. The mountain lion is renowned for its remarkable power, stamina, and agility. It can easily cover 23 ft. in a single bound, and a leap of twice this distance has been recorded. Often taking cover in the dense foliage of a tree, a mountain lion can leap up to a height of 18ft to land in the branches. It may then climb upward, looking for a suitable Vantage point. it can drop 65 ft to the ground without injuring itself. The FWC is interested in photos of The Florida Panthers or their tracks.